Bring 8 cups water to a boil in large saucepan. Add broccoli and cauliflower; return to a boil. Boil 2 minutes. Drain; rinse with cold water to cool. Separate broccoli and cauliflower. 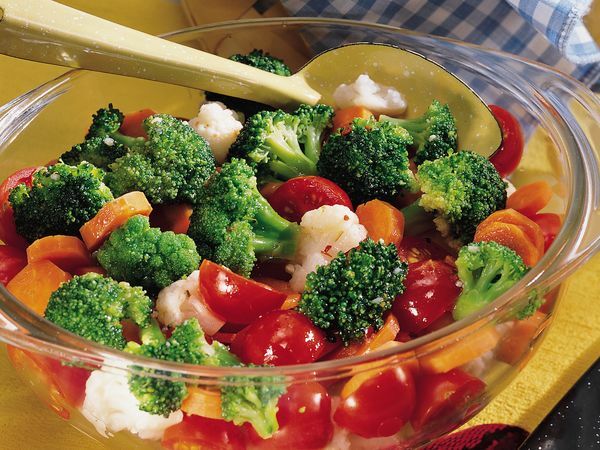 In large glass bowl, layer cauliflower, cherry tomatoes and carrots. Pour dressing evenly over all. Top with broccoli. Cover; refrigerate at least 1 hour to marinate before serving.